Here’s what my amazing book designer came up with, using MY photo. He’s awesome. With the help of a childhood friend, a concerned newspaper reporter, and visions by a strange old woman, a two thousand year old mystery begins to unfold, uncovering missing children throughout generations. Who is taking them? Could it be the infamous witches of Witch Dance? Emily and Sarah squealed as they raced each other toward the pair of small hills that sat at the edge of a field. No tree or bush grew on top of the mounds. They were simply two barren knolls of smooth earth, offering neatly manicured grass and clear views of the surrounding land. These hills, historically known to be the ancestral burial grounds of the Hopewell Indians, are today known as the Bynum Mounds, a minor tourist attraction on the Natchez Trace Parkway. The six-year-old girls raced to the hills as fast as their legs would run. This was nothing new. They raced everywhere. They’d done so since before they learned to walk, crawling faster and faster to beat the other to the prize at the end of the race. Born mere minutes apart, they held the typical sibling rivalry, vying against each other for the prized possession, the favorite toy, or the brightest crayon. But, their favorite competition was racing to the next spot, always endeavoring to be in the lead. Margaret and Thomas Speedwell had driven down the Natchez Trace from Nashville for a long-overdue getaway with their girls. They arrived yesterday, excited for their weekend camping trip at a place just north of the Bynum Mounds—a campground called Witch Dance. Witch Dance sounded like a fun place to spend the weekend. It sported an elaborate history, rumored to be the place where witches held their eerie rituals and ceremonies. Legend has it that witches danced around bonfires, and where their feet touched the ground, no grass ever grew again—even until this day. The sign at the entrance stating the legend about the witches was a popular place for souvenir photos by the people who frequented the site – families, ghost hunters, and the curious. The Speedwell family didn’t come down for a ghost hunting expedition. This weekend was simply a chance for Margaret, Thomas, and their girls to shed the stress of their everyday lives and have a little fun. “I wish they wouldn’t run ahead like that,” Margaret grumbled from the parking lot. Thomas sensed his wife’s tension, marked by a crease of concern peppering her forehead. He gently reached for her hand as they strolled from the parking lot toward the mounds, following their daughters. The lack of shrubbery and trees made it easy to keep an eye on the girls, but the clear line of sight didn’t help Margaret relax. Thomas squeezed her hand. “You should let them run as much as they want. Someday they’ll win medals in track or become world-class cross-country runners.” He chuckled softly, attempting to lighten her mood. Margaret puckered her brow. Thomas knew his carefree tone of voice wasn’t going to make her concerns disappear. He knew she wanted her girls to be proper ladies, not sweaty athletes. He felt her stiffen when they heard Emily shriek and they both watched the girls run up to the top of one of the hills. Emily shrieked as Sarah grabbed the back of her pink shirt, attempting to catch up, but the material slipped from her fingers. Emily stretched her arm back for Sarah to grasp, and they both laughed as Sarah grabbed on and Emily pulled her forward. The curly-headed blondes crossed over the ridge on the top of the hill and began their descent down the other side when they suddenly stopped in their tracks, their eyes wide at the vision looming in front of them. On a perfect late summer day with a clear blue sky and bright sunshine, a large cloud rested on the other side of the hill. Not a puffy white cloud—more like a menacing shadow. It slowly swirled and circled about a foot above the ground as if some imaginary wind was trying to create a tornado, but there was no wind, not even the slightest breeze. The shape and movement resembled the twister the girls had seen in the movie with Dorothy and Toto, but there was no dirt or debris or witches or houses in the vortex, just blackness. The girls froze and squeezed each other’s hands. Emily wanted to scream, but she could only open and close her mouth like a fish washed up on a beach. No sound came. It was as if the shadow had sucked all the air out of her lungs. The black maelstrom quickly increased in size and volume as the whirling winds began to howl, starting first as a low hum and growing louder with each passing moment. The hum grew to an ominous sound, simultaneously emitting an ear-piercing shriek and a low agonizing moan. The girls instantaneously released each other’s hands and covered their ears against the painful sounds. The turbulence continued to expand, growing larger and larger as it moved closer to them. Even with her hands over her ears, Emily thought she heard human voices mumbling something beneath the roar of wind. She narrowed her eyes and cocked her head as if doing so would make the voices clearer. She couldn’t take her eyes off the vortex, but she felt Sarah reach for her arm. Sarah took a step forward, trying to pull Emily forward with her, but Emily pulled back and Sarah’s fingers lost their grip. Emily didn’t want to go forward. As a matter of fact, everything in her gut told her to turn and run in the opposite direction. Run back to her mother, back to her father, back to safety. She sensed a great wickedness in the sight before them, something evil in the whirling darkness. She knew a malevolent presence lurked inside of the shadow. It watched them from the blackness, wanting them to come closer. Sarah grabbed a handful of Emily’s shirt and pulled harder. Emily pulled back again. She turned to run, the pink cotton material of her shirt, again, slipping from Sarah’s grasp. Emily ran back the way they had come as fast as her legs would carry her. She was certain Sarah would follow. Sarah always followed. The moment she reached the top of the hill, the roaring stopped. The sound of the whirring, the voices, the wind instantly vanished. She saw her parents casually strolling, hand-in-hand, toward the hill. Why weren’t they running? Didn’t they hear the horrible tornado that almost devoured their children? Emily turned around to look for Sarah, but there was nothing behind her but the bright, sunny valley below. The tornado had vanished. There was no sound, no vortex, no Sarah. Available now at Amazon, Barnes & Noble, iBooks, Kobo. You can compare this rough draft with the final. My editor rocks! The following is a rough draft of my current work-in-progress, The Culpepper-Fairfax Scandal. Catherine Culpepper is nineteen years old, and her rich father, Lord Thomas Culpepper the baron of Thoresway, has just died. For two decades, he had been living in London with his mistress and had left everything to the mistress in his will, but Catherine’s mother had the will suppressed. This scene takes place at the probate hearing at Westminster. Thanks to her mother, Margaretta, and her uncle Alex, Catherine inherited nearly everything. When the proceedings ended in Catherine’s favor, Margaretta and Alex attempted to whisk Catherine from the courtroom, but they were met at the door by a crowd of enthusiastic well-wishers and more than a few gentlemen of questionable intentions. Catherine had just inherited more wealth than she could ever dream of. Not only was she now the sole owner of Leeds Castle, she also held manors and lands in Sussex and Essex, and was one-sixth owner of the proprietorship of the Virginia Colony. The crowd’s din grew as they attempted to get closer to the wealthy heiress. Pushing and shoving toward her, people reached out to touch her, to take her hand, to gain her attention and her favor. When the family emerged from Westminster, Alex hailed their coach, but when he turned back for Margaretta and Catherine, they had been separated from him by a sea of bodies. Margaretta reached for her daughter’s hand to pull her through the crowd, but their fingers were inches away from each other’s as Catherine was pushed back by the crowd, away from the protection of her mother and their waiting carriage. Catherine heard her mother’s call but couldn’t see her over the heads of the people surrounding her. She attempted to turn, but a growing throng of people blocked her way. Someone was standing on the hem of her gown, stifling her movement, lest she rip her skirts. Her mother called for her a second time. Her heart began pounding as she heard the panic in her mother’s voice and suddenly realized she might be in a dangerous situation. The crowd was growing riotous, pulling at Catherine’s clothing and her hair. Her honey-colored curls fell to her shoulders as her hairpin was snatched from her head, taking with it a handful of hair. She cried out for her mother, for her uncle, for anyone to save her from the melee. It was then that she felt a strong arm around her waist and another under the back of her legs. “I’ve got you,” he whispered in her ear. She was scooped into the arms of a savior. She buried her face into his shoulder as he pushed his way through the crowd toward the waiting carriage. When she was gently placed onto the seat in the carriage, she smoothed her hair from her face and lifted her eyes to look at her uncle. But her savior wasn’t Uncle Alex. Before her stood a striking man whose brown eyes bore into her own, his dark curls falling over his brow, his full lips begging to be touched. Their eyes locked as if time stood still. He then nodded to her and quickly closed the carriage door, disappearing into the crowd. Uncle Alex yelled for the driver to make haste, and the carriage sped away from the scene, the wheels bouncing on the rough cobblestone street. I began researching my ancestry as a teenager. I knew my Culpepper line came to America from England in the 1600s, and I knew they were wealthy land owners with much prestige in the English court, but I didn’t understand why they would give all that up to sail to an inhospitable land full of savage Indians, facing the possibility of shipwreck, starvation, and death. How did those aristocratic people end up as the modest family I knew in my youth in Mississippi? The journey to find these answers became a series of four books about my 10th great-grandfather, John Culpepper. 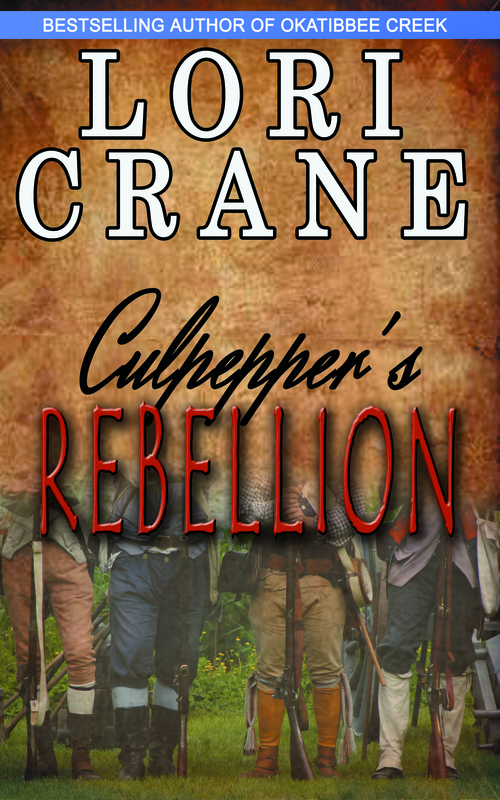 Follow the series as John rebels against his father, the English civil war destroys the family, John ends up as the family patriarch in the colony of Virginia, and finally, as John comes to terms with his life and his past. 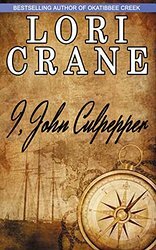 The first book in the series is I, JOHN CULPEPPER. 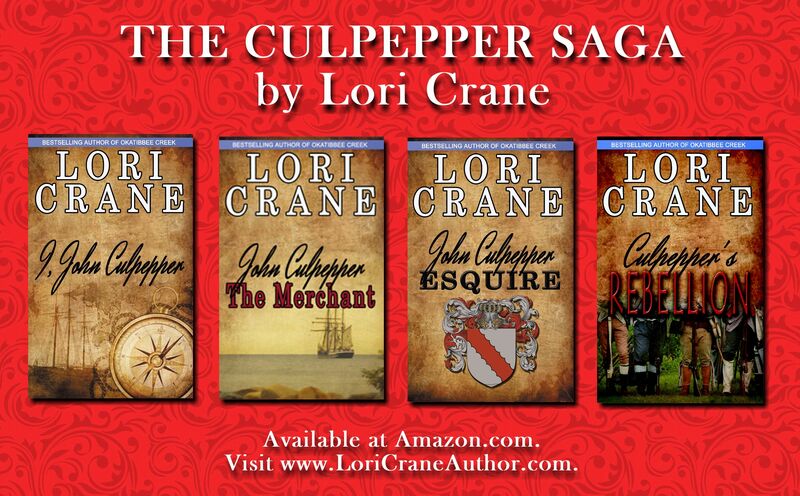 The subsequent books are JOHN CULPEPPER THE MERCHANT, JOHN CULPEPPER ESQUIRE and CULPEPPER’S REBELLION. Here’s the opening chapter of I, JOHN CULPEPPER, setting the stage with his tumultuous relationship with his dad. John looked down at the intricate grain of the walnut desk beneath his fingertips and shifted his weight to his other foot. He sighed, feeling his dreams disintegrate before his very eyes. The snap of the white sails, the taste of the salty spray on his lips, the smell of the tar that sealed the decks—the visions were quickly vanishing behind the thick fog of his father’s adamant disapproval. He pictured his mighty ship sinking into the black waters of condemnation, bubbling like a cauldron as it disappeared from sight. There was nothing he could do to change his father’s mind, and he wondered whatever possessed him to come to this man for assistance. He should have known better. His father glared at John from behind the desk. He propped his elbow on the scrolled arm of the chair as his large hand methodically stroked his pointed beard. “Is there anything else?” he snapped. John released the doorknob and walked back toward his father’s desk. The intimidating man dwarfed the desk, his size exaggerated by the broad shoulders of his leather jerkin, yet he sat up taller in his chair in preparation for the quarrel to continue. It was a wasted gesture, as his opponent already knew the battle was lost. John exhaled, beaten. His shoulders slumped as he broke his father’s glare and dropped his eyes to the floor. 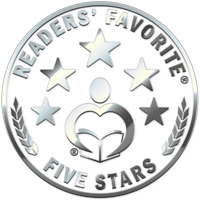 The recipient of 5-stars at Readers’ Favorite, I, JOHN CULPEPPER is available in paperback and Kindle at Amazon. CLICK HERE. Amazon sale rumor, snippet, and a FREE book! Word on the street is Amazon will celebrate its 20th anniversary on July 12 and will kick off a mega sale sometime during the week. I’ve heard they have asked for overtime by their staff, hired some temps, and notified their carriers that the volume of packages will double. Update: Amazon has confirmed a huge one-day sale called Prime Day on July 15. Lightning Deals, seven Deals of the Day, and according to Amazon, more deals than black Friday. Well…cool! 7,305 days we’ve been together and I still love you, Amazon! I’d like to take you back in time to the War of 1812 with a snippet of my book ELLY HAYS. Elly’s husband has decided to move the family from Tennessee to the Mississippi Territory, the land we know today as Alabama. He wants to get his family out of the way of the coming war. Little does he know, the Creek Indians living in the place he wants to go are in the middle of a civil war, so he is completely wrong about the family’s safety. Too bad they won’t find that out until they get there. 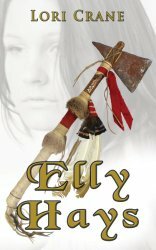 I’d like to offer you a FREE Kindle copy of ELLY HAYS while your shopping the sale at Amazon July 12-16. Click here to visit the ELLY HAYS Amazon page and bookmark it so you can return July 12-16 and get your FREE copy. She looked at him in disbelief and didn’t know what to say. He had a tendency to exaggerate, so she didn’t know if he was being truthful or purposefully saying shocking things about the children’s welfare to get her to agree to move. ELLY HAYS is FREE at Amazon July 12-16. My new book, John Culpepper the Merchant, takes place in the 17th century, both in the colony of Virginia and in the country of England. England was in the middle of a civil war, and John’s uncle, Sir Alexander Culpepper, was a knight in the king’s army. At the battle of Bridgewater, we witnessed how brave Alexander really was. “Advance the second cavalry!” Goring commanded. The second group galloped down the hill. That’s when Alexander saw them on the other side of the stream. Fairfax’s cavalry appeared out of nowhere, crossing the ford with nothing to stop their advance. There was no clanging of armor as with a regular group of horse heading into battle. Alexander knew these soldiers weren’t in armor. The weight would slow down the horses. He had to admit, Fairfax was a brilliant commander. There was no thunder of hooves as the horses were not galloping. The approaching men were dressed in leather jerkins and moved to a strange and ominous sound of marching hooves and creaking leather. A menacing sound sure to make even the most courageous opponent question his bravery. They advanced four abreast, knee to knee, with four more behind, and four more behind that. There had to be hundreds of them. They looked like demons rising from the very depths of hell, bent on killing each and every royalist. What happened to the day of fighting with honor and valor? When did the parliamentarians stop taking prisoners? When did they start killing every man who crossed their path? The Welsh soldiers were gone. The light guns were gone. The only thing standing between success and defeat were the three groups of horse, two of which were not faring so well against Fairfax’s army. “Ready your swords, gentlemen!” Alexander yelled to his men who were waiting nervously at the top of the ridge. Nearly half his men were not professional soldiers but farmers. They weren’t used to facing anything this terrifying. He wasn’t sure he had ever faced anything this terrifying. “Steady…” He watched the horses below him advance across the ford, and far in the distance, he recognized a figure dressed all in black astride a white horse. Fairfax. Black Tom, the royalists called him. The man sat tall in his saddle at the back of his army, looking like Satan himself. Alexander felt his adrenaline rise. Today would be the day General Thomas Fairfax paid for his decision to abandon the king’s men. Today would be the day Black Tom took a sword through his black heart. Alexander’s men waited and watched, their horses prancing nervously. Fairfax’s group of horses easily destroyed Goring’s first line, scattering the men about the marsh like scarecrows. Even horses lay dead. Alexander grimaced as he watched more men fall and some of the horses run off. The second group fought more diligently than the first and Alexander thought for a moment they could win the battle. That’s when he saw the next group of Fairfax’s men on horseback, larger than the first, crossing the stream, again four abreast. There had to be more than two hundred of them. “Ready, men!” He yelled to his group of sixty men. Their swords glistened in the sunlight. This would be the day of their greatest victory or their worst defeat. 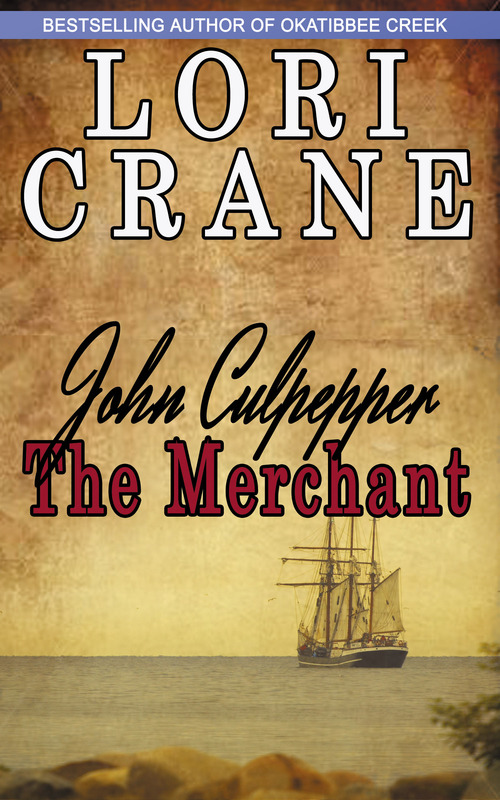 John Culpepper the Merchant is available in Kindle and paperback at Amazon. For pictures, paintings, and documents of the people and places in the series, visit the Culpepper Saga Facebook page.